A combination of confusion, anger and despondency has taken root in the Irish language community over the past month as people digest the repercussions of the disastrous decisions taken by Foras na Gaeilge. These will end core-funding for many organisations in the six counties and across the island, as part of a wide-ranging programme of cuts that has been planned by the Free State government since 2009. As often happens in such ‘top-down’ processes of ‘divide and conquer’, much of the anger is directed at the gate-keepers, bean-counters and middle-men of the Foras itself. Despite this, the primary driver and defining context of this assault must be recognised as government cuts by the 26 county state. When the so-called ‘Celtic Tiger’ spectacularly collapsed in 2008, the then Gaeltacht Minister, Eamon Ó Cuív, promised the elites that he could make ‘significant savings’ for the public purse by amalgamating and scrapping Irish language groups. It is no surprise, perhaps, after many generations of deception and sham that the Irish language community was forced into the queue of vulnerable victims that gave a free rein to bankers who gambled economic sovereignty away. Driven by Thatcherite neo-liberalism, the approach neglected revival and community regeneration and was replaced by ‘performance indicators’, ‘measurable targets’ and ‘results’. It was from this rationale that Foras na Gaeilge received a directive from the North-South Ministerial council in December 2009, to ‘reorganise’ the Irish language voluntary sector through ‘rationalisation’ that promoted ‘cost-effectiveness’. Although language activists weren’t opposed to a restructuring process that properly assessed and evaluated services and resources, it was in the absence of any form of comprehensive research or auditing on the work and worth of core-funded groups, not to mention, language planning, that Foras na Gaeilge proposed ‘schemes’ in 2011, by announcing a competitive ‘new funding model’ that would bring an end to the 19 core-funded groups across the island in favour a small number of ‘lead organisations’. When all this is taken into consideration, it is a source of surprise that the groups manage to garner a couple of extensions, a public ‘consultation’ and a protracted ‘stay of execution’, during which crippling cuts were relentlessly imposed, before the majority of the ships were forcibly sunk in January 2014, with a similar but ‘newer’ funding model. It was decided, through a classically divisive methodology, that the ‘heads’ of the 6 new ‘lead-organisations’ would sit on a ‘Forum’ with representatives from the Foras na Gaeilge ‘gatekeepers’ to enshrine a ‘new era’ for the Irish language. These seats at the top table for an appointed minority will ensure the disempowerment of the community and severely endanger the independent voice of the funded Irish language sector. ‘All-Ireland’ rhetoric and claptrap was skilfully utilised to deceive some naïve politicians into believing that we are destined for a more effective model. However, any objective analysis suggests that the new arrangements will only serve to strengthen partitionism with every lead organisation, and the associated influence bestowed upon them, located for the most part in Dublin’s Golden circle. fifteen years after the Good Friday Agreement and thirteen years since the Foras itself was founded, it seems that Free-State civil servants, in conjunction with a sleepwalking DCAL department, have succeeded in pushing us back to the old status quo when Bord na Gaeilge ruled the roost, with the ‘black north’ a mere footnote on the map. The limited status that the Irish language community in the North received through the cross-border Foras was important in that it created the space to build a physical infrastructure with offices, projects and staff working on the ground. 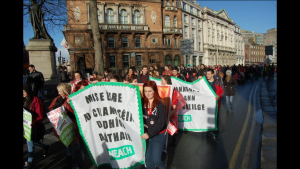 It was a start in a hostile state where the language suffered due open contempt and legislative persecution for 75 years, where it survived in spite of the state through voluntary endeavour that fostered the community-based Irish-medium education revolution. After a mere thirteen years of recognition, this work is undoubtedly only in the early throes of building expertise, best-practice and a strong foundation against the backdrop of continuing widespread hostility amongst political unionism that continues to stymie the potential of the Irish language community in the north. With funding to be removed from groups like POBAL, Forbairt Feirste, Altram agus Iontaobhas Ultach, there is a distinct uncertainty again for Irish language resources in the sectarian state in the north, where the discourse of ‘good-relations’ and a ‘shared future’ are continually used to keep Irish speakers at the back of the bus. This was recognised at international level the day before the assault on the Irish language groups when the Council of Europe confirmed that the Stormont Executive was clearly failing it is duty to provide equality of treatment to the Irish language in a range of domains such as education, the media, the courts and public signage. Citizens and tax-payers in the six counties are entitled to equality and value for money in terms of state investment in Irish language serivces. We require a language infrastructure that fulfils our needs as a language speaking community with specific rights and entitlements. This means jobs, projects, offices, resources and strong, capable groups based in the north. In the short-term, there is a need to fight to preserve the current jobs and resources that are in danger while recognising that this is merely the beginning of a long-term, broad-based battle to be waged in the time ahead. legs, the Language Commissioner having resigned from his post and the so-called government ‘Language strategy’ in tatters, a diverse constituency of Gaels came together determined to fight back. It was a political reawakening for the Irish language community on a national scale that also emphasised the systemic discrimination suffered by Gaels in the sectarian state in the north in the absence of any legislative protection. This also highlighted the merits of more locally directed campaigning in the context of endemic discrimination here in the north, whilst realising the importance of remaining rooted in the same national struggle being waged by communities across the island who are similarly committed to the reconquest of the language. It’s from this logic of struggle that another public demonstration and march has been announced for Belfast on April 12 to ‘build on the wave of energy which currently is flowing thus turning it into an unstoppable tide, and into a proud, united, open community that is defined by solidarity, love and joy’ as stated by the Nosmag editorial. If the ‘new era’ we were promised is to come to pass, then its timely that we foster a bottom-up campaigning culture that builds a movement, that raises our voices, demands our rights, protects our services and challenges the strategy of ‘divide and conquer’ of both failed states in Ireland. Is meascán de mhearbhall, fearg agus díomua atá ar Phobal na Gaeilge le mí anuas agus muid ag teacht i dtaithí ar chinneadh thubaisteach Foras na Gaeilge. Cuirfidh seo deireadh le bunmhaoiniú roinnt eagraíochtaí sna sé chontae, agus ar fud an oileáin mar chuid de phróiseas fhada cuíchóirithe atá beartaithe ag an stát ó dheas ó bhí 2009 ann. Mar b’iondúil le próiseas ‘scoilt agus smachtú’ a bhrúitear ón bharr anuas, treoraítear mórchuid na feirge i dtreo geatóirí, cuntasóirí pónairí agus meánleasóirí an fhorais féin. Mar sin féin, caithfear comhthéacs na gciorruithe stáit sna sé chontae fichead a aithint mar príomhthiománaí an tslaid. Nuair a thit an tóin as an Tíogar Cheilteach in 2008, gheall an t-Aire Gaeltachta ó dheas, Eamon Ó Cuív do na móruaisle go dtiocfadh leis ‘sábháiltí suntasacha’ a dhéanamh tríd grúpaí Gaeilge a chónascadh le chéile agus a scor. Níorbh ionadh is dócha i ndiaidh glúnta fada don bhéal bhán agus cur i gcéill gur roghnaíodh pobal na Gaeilge don scuaine d’íobartaigh leochaileacha a a chinntigh talamh slán do bhaincéirí agus lucht mórchearrbhachais eacnamíochta. Tiomnaithe ag cur chuige nua-liobrálach an Thatchereachais, rinneadh neamhaird ar athbheochan agus claochlú pobail agus ina n-áit leagadh béim ar ‘spriocanna feidhmíochta’, ‘targaidí inthomhaiste’, ‘torthaí’ agus araile. Is mar gheall air seo a tháinig treoir ón Chomhairle Aireachta Thuaidh-Theas ( CATT) i mí na Nollag 2009 d’Fhoras na Gaeilge chun atheagar a dhéanamh ar earnáil dheonach na Gaeilge tríd ‘cuíchóiriú’ a bhrú uirthi ar mhaithe le ‘cost-éifeachtúlacht’. Ainneoin nach raibh díograiseoirí teangan in éadan athstruchtúrú a dhéanamh ar mhaithe le luacháil chuí ar sheirbhísí agus acmhainní s’againne, is in éagmais aon taighde nó iniúchadh cuimsitheach ar obair agus fiúntas reatha na n-eagraíochtaí, gan trácht go fiú ar phleanáil teanga, gur mhol Foras na Gaeilge ‘scéimeanna’ in 2011, a bhí le fógairt i bpróiseas iomaíoch agus ‘Samhail Nua Mhaoinithe’ a chuirfeadh deireadh leis na 19 eagraíocht bunmhaoinithe Gaeilge ar fud an oileáin ar mhaithe le roinnt ceanneagraíochtaí. Nuair a ghlactar seo ar fad san áireamh, is ábhar iontais gur éirigh leis na grúpaí cupla sínte ama, ‘comhairliúcháin’ poiblí agus ‘stay of execution’ de chúpla bliain a fháil, inár cuireadh ciorruithe fiochmhara i bhfeidhm, sular brúadh mórámh na loinge go tóin poill in Mí Eanair 2014 le samhail maoinithe nua den chineál céanna fógraithe. Is fríd chur chuige scoilteach, clasaiceach ar aontaíodh ar 6 ‘ceann-eagras’ agus a gcuid ceannasaithe le suí ar ‘Fhóram’ le hionadaithe ó gheatóirí an Fhorais féin, chun ‘Ré úr’ don Ghaeilge a chinntiú! Suíocháin ag an bharrthábla chun ról speisialta a thabhairt do mhionlach ceaptha a chinnteoidh díchumhachtú an phobail agus a chuirfeas guth neamhspleách don earnáil mhaoinithe teanga i mbaol. Úsáideadh reitric agus baothchaint ‘uile-Éireann’ chun dallamullóg a chur ar roinnt polaitieoirí neoid gur múnla níos éifeachtaí atá i ndán dúinn. Léiríonn aon anailís fhuarchúiseach, áfach, gur ag buanú an chríochdheighilteachais a bheas an múnla úr le gach ceanneagraíocht, agus an príomhthionchar a bhronnfar orthu, fréamhaithe don mhórchuid timpeall ciorcal órga Bhaile Átha Cliath. Cúig bliana déag i ndiaidh Comhaontú Aoine an Chéasta agus trí bliana déag ó bunaíodh an Foras féin, tá gach cuma ar an scéal gur éirigh le státseirbhísigh an tsaorstáit, le comhar ó pholasaí suanshiúil an ranna DCAL, muid a bhrú ar ais i dtreo an sean-status quo nuair a rialaigh Bord na Gaeilge leis an ‘tuaisceart dubh’ mar fhonóta sa léarscáil. Bhí an stádas teoranta a fuair pobal na Gaeilge ó thuaidh tríd an Fhoras tras-teorann tábhachtach mar go dtug sé deis infrastruchtúir fhisiciúla a thógáil le hoifigí, tograí agus oibrithe lonnaithe ar an talamh. Tús a bhí ann i stát coimhthíoch inár fhulaing an teanga de bharr naimhdeas foscailte agus géarleanúint reachtaíochta thar tréimhse 75 bliain, áit ar mhair sí in ainneoin an stáit trí ghníomhaíocht dheonach a thionscnaigh réabhlóid pobalbhunaithe an Ghaeloideachais. I ndiaidh trí bliana déag d’aitheantás, níl amhras ach go bhfuil an obair seo ar tús cadhnaíochta agus é ag tógáil saineolais, dea-chleachtais agus dúshraithe bíodh is gurbh éigean maireachtáil i dtosca sáiniúla ina bhfuil naimhdeas foscailte an aontachtachais pholaitiúil ag coinneáil cos ar bolg ar phobal na Gaeilge go fóill. Le maoiniú bainte ó eagraíochtaí cosúil le POBAL, Forbairt Feirste, Altram agus Iontaobhas Ultach, tá éiginnteacht fhollasach ann arís d’acmhainní na teanga sa stáitín seicteach ó thuaidh ina bhfuil dioscúrsa an ‘dea-chaidrimh’ agus ‘todhchaí roinnte’ in úsáid chun pobal na Gaeilge a choinneáil in áit na leathphingine. Tá cáiníocóirí agus saoránaigh an tuaiscirt i dteideal cothrom na féinne agus luach airgid d’ infheistíocht stáit i dtaobh na Gaeilge. Tá muid i dteideal infrastruchtúir teanga a dhéanann freastal ar mhianta s’againne mar phobal labhartha teanga le riachtanais agus cearta. Ciallaíonn seo postanna, tograí, oifigí, acmhainní agus grúpaí láidre, cumasacha lonnaithe ó thuaidh. Sa ghearrthréimhse, caithfeár troid ar son na bpostanna agus acmhainní reatha atá i mbaol ach aithint nach seo ach an tús agus cath fadtéarmach, leathan le forbairt sa tréimhse amach romhainn. Is trathúil go bhfuil na hionsaithe seo ag tarlú agus aeráid úr feachtasaíochta ag forbairt sa dlínse dheisceartach le mórshiúil spreagúil díreach i ndiaidh titim amach ar an satharn seo caite, 15 Feabhra agus 10,000 Gaeil ag déanamh athghabháil ar phríomhchathair na tíre. Síníodh an spotsholas ar chaimiléireacht agus cur i gcéill an Rialtais ó Dheas i dtaobh na Gaeilge. Le tacaíocht stáit don Ghaeltacht ar an dé deiridh, an Coimisinéir Teanga ag éirí as a phost agus bréagstraitéis na Gaeilge ‘i dtraipéisí’, tháinig réimse leathan Gael le chéile go díongbháilte ag beartú troda. Athmhuscailt pholaitiúil a bhí ann do Phobal na Gaeilge ar scala náisiúnta a chur béim fosta ar an neamart córasach a fhulaingíonn na Gaeil sa staitín seichteach ó thuaidh in eagmáis aon chosaint reachtúil. i gcomhthéacs idirdhealuithe an stáit sheictigh, ach é sin bheith fréamhaithe sa troid náisiúnta céanna atá á bheartú ag pobail ar fud na tíre ar son athghabháil na Gaeilge. Is ag eascairt ón loighic streachailte seo ar fógraíodh móshiúil eile do Bhéal Feirste ar an 12 Aibreán chun ‘tógáil ar an tonn fuinnimh ar a bhfuil muid faoi láthair agus é a thiontú ina rabhartha dostoptha, ina phobal bródúil, aontaithe, oscailte, lán dlúthpháirtíochta, grá agus spraoi’ mar a dhéarbhaigh éagarfhocal Nosmag. agus smachtú’ an dá stát teipthe in Éirinn. Maith thú. Scríofa go maith agat. I am disgusted by the decision to take core funding from Altram, and agree wholeheartedly about the claptrap and rhetoric, all sounds impressive but what’s the point in funding all sorts of minor window-dressing tat while removing the very basics.